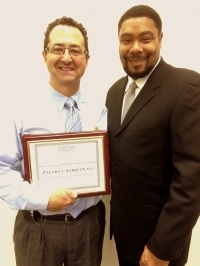 John Zagara of Zagara's Marketplace accepts the Outstanding Community Partner Award from Heights High principal Zoraba Ross. “Behind Every Great Student is a Great Community.” This was more than a slogan at the Reaching Heights annual meeting on Dec. 3. Ashlie Dyer, incoming board president, described Reaching Heights’s posters, hanging in businesses around the community, that advertise the slogan, and celebrate the teachers, coaches, parents and community members who represent everyone that supports Heights children. At the meeting, two members of this “great community” received awards for their extraordinary efforts. Zoraba Ross, Heights High’s administrative principal, presented the Outstanding Community Partner Award to Zagara’s Marketplace for its decades of generosity and active support of public school students. Accepting the award, John Zagara spoke about dramatic changes in grocery retailing—competition, consolidation and consumerism—and the special role of the few remaining independent, family-owned grocery stores, like Zagara’s Marketplace. 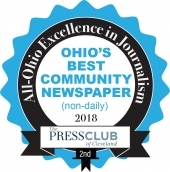 Zagara shared a lesson he learned from his father, as a teenager working at Zagara’s grocery stores at 143rd and Kinsman, and then at Shaker Square: Local businesses can make a difference by hiring the community’s young people for their first jobs. He explained how such early business experiences can teach important life lessons: do your work well, dress properly for your job, work hard, and learn to keep the job. “We are all responsible for raising the next generation,” concluded Zagara. Reaching Heights honored Don Frederick, a parent, community member and catalyst for positive change in the school district, with its Friend of Public Education Award, honoring a citizen who embraces our shared responsibility for the success of our public schools. Frederick regularly attends board of education meetings, and has managed the distribution of yard signs for school levy campaigns since 2000. For years, Frederick has been an outspoken advocate for Career and Technical Education. Frederick remarked on his own childhood, when school played a stabilizing role in his life, and echoed Zagara’s remarks: “It is a moral responsibility for us all to be involved and help all kids in our school district.” He challenged community members to “pick something” that they are interested in, that would support public education, and work on it. 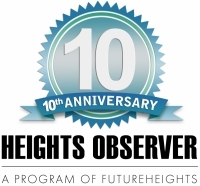 Reaching Heights is a community nonprofit that promotes student achievement, honors teachers, and connects the Heights community to its public schools through programs, events and communication. To learn more and become involved, visit www.reachingheights.org or call 216-932-5110. Lisa Hunt is assistant director of Reaching Heights.